I’ve recently been thinking a lot about the ‘Haves’ and ‘Have Nots’, about aptitude, luck and opportunity. Questions of cultural legacy and the onus of the individual within society have been swirling round my head. It is in this frame of mind that I went to see Top Girls, the Chichester revival currently at Trafalgar Studios. I’d just devoured Malcolm Gladwell’s Outliers which looks at our ideas of success and the myths we have around successful individuals. It’s fair to say that I was excited to see Caryl Churchill’s repost against The Iron Lady. But in this heavily empathic production Max Stafford-Clark has missed the point about the relevance of Top Girls for today. Churchill’s text is often quoted as a feminist classic. Looking at ideas of motherhood, sisterhood and the world of work, it asks ‘Do women have to follow the patriarchal rules of this society to succeed?’ Questions like these are still sadly relevant today (it’s remarkable that Top Girls is the only play on the West End with an entirely female cast – as pointed out by Fiona Mountford, herself a woman in a male dominated career). But I would argue that right now these questions are superseded by the more universal, underlying thrust of Churchill’s play; what happens to weaker individuals in a society that is so focussed on the idea of success? As we hurtle head-first into a world where social housing, school start-up programmes and the NHS are being ruthlessly cut, isn’t this the question that matters most? Dished up neatly in three acts, the third is the most politically potent. The gloriously surreal first act (where Marlene hosts a dinner party for historical heroines such as Pope Joan) is everyone’s favourite. The second addresses women trying to be men in the workplace (probably the most redundant portion for 2011), but it is the third that should do the most damage. A brilliant piece of political polemic powered by the embittered relationship of two women, it centres around a showdown between Marlene, a pure child of Thatcher and her socialist sister, Joyce. At the centre of this antagonism is Angie, ostensibly Joyce’s daughter but actually Marlene’s. Just as Marlene is bellowing that anyone can get ahead if they work hard enough, the fact that she was only able to do so because Joyce picked up her tab hangs over her head. Churchill is waging war against the selfish drive of Conservative Britain in the 1980s, and it’s an argument that transfers powerfully to Conservative Britain today. Yet in Stafford-Clark’s production, the sting of this parallel has been lost. The women in Top Girls are vehicles for a dialectical discussion. Of course, because Churchill is a strong writer, there are elements of psychological truth within all of them, but apart from Marlene none of these characters is developed throughout the play. Top Girls has been constructed functionally as a means of discussing Churchill’s ideas of socialist feminism and the characters within it are there to serve that function. But by focussing instead on them as psychological individuals Stafford-Clark has ignored this functionality. In softening Marlene, he has diffused the power of the third act. The battle between socialism and individualism should be gut wrenching and thought provoking but here it just feels flat because as Isabella Bird’s Joyce rails, Suranne Jones’ soft focus Marlene simply defends. With no qualifications or future prospects, Angie is the real victim in the brave new world that Marlene is so zealous about. At the end of the play, Angie’s final strangled cry of ‘Frightening!’ should be devastating. This is a girl completely failed by a society that her mother not only inhabits but, worse, promotes. Angie’s anguish is a provocation to a world where only the strong survive. In this production, an otherwise superb Olivia Poulet delivers the line like an after thought. By personalising Marlene’s journey Stafford-Clark has robbed this final impotent cry of its power just when we needed to hear it most. 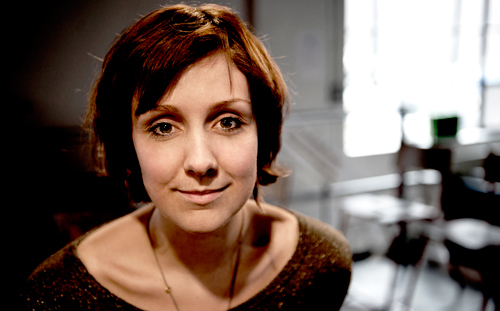 Ella Hickson made her name at the Edinburgh Festival in 2008 with her play Eight, picking up a Fringe First and The Carol Tambor ‘Best of Edinburgh’ Award. Her second play transfers to London. Ella you’ve had a pretty meteoric rise since 2008 as a young artist. What was your route into this business we call show? My university theatre runs a free fringe slot, you just have to come up with an idea and put it forward. Luckily my idea of eight monologues got selected and so I had to write them. It was a pretty straight forward process, I knew eight good student actors and so we created the pieces through conversation, it was a really wonderful process. Being a writer is quite an isolated profession. How helpful have your various secondments and attachments to theatres been? Hugely. I am really very grateful to Katherine Mendelsohn and the team at The Traverse and also Simon and Sean and the team at The Lyric. Without these communities I think I would have found the past few years really hard going. It’s very important to be connected to a theatre, to understand the workings of a building and to feel like you belong somewhere. Some people say you have to have lived it to write about it, how do you feel about that? Well I’ve never blown up any buses or stripped any corpses so I guess it isn’t true! Having said that I think all good writing holds a kernel of universal truth and it helps to have some relation to that truth even if you haven’t experienced it. All over the place, snippets of conversations – watching films or plays – conversations – books. I get a lot from talking to my friends. After so much success with Eight, did you suffer with any ‘difficult second album’ moments with Precious Little Talent? Of course. I felt like there was a lot of pressure on me to perform with Precious Little Talent, hence the slightly provocative title. But in hindsight I think that pressure was largely in my own head. Plays come and go and press rarely think about a review once it’s written. You have to be committed to the work, not the response it gets, its the only way to keep doing the best you can. Precious Little Talent taps into feelings of abandonment that are incredibly prevalent at the moment. But it’s not about powerlessness, in fact it seems an inherently optimistic play. Was this important to you? At the time, yes. I think there is little point in paddling around in doom in gloom unless you at least explore some routes out of that situation. Plays need to be about change, about transformation – if people are abandoned we want to see them strive to be found. How involved have you been with this production of Precious Little Talent? In the rehearsal room are you a ‘hands on’ writer or do you believe in letting the work go to a certain extent? It’s been a learning curve as this is one of the first few times I’ve ever had to do it as I’ve usually directed my own stuff. I have a really good working relationship with James and there’s definitely a culture of open communication and co-operation which makes it all a lot easier. Why should people come to see Precious Little Talent? It has a charming combination of humour and pathos. It’s a very contemporary play with that good old fashioned entertainment tone of laughter and tears. 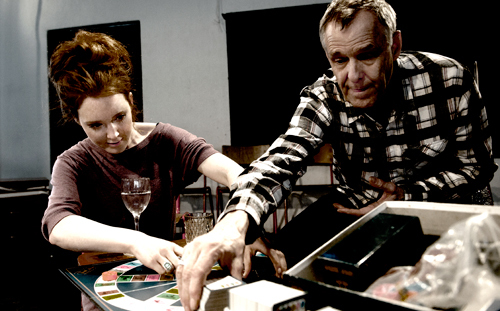 Precious Little Talent runs at the Trafalgar Studios from 8th April until 30th April 2011. A hymn to companionship, music and the sea Novecento is a love song set in a time when romance infused the everyday and men were still legends. Alessandro Baricco’s rich monologue, part of the Donmar Trafalgar season, is an engrossing and engaging tale of “the greatest pianist who every played on the Ocean.” It may stumble into the trap of verbose sentimentality towards its explosive conclusion, but Ann Goldstein’s wry translation ensures this is, for the most part, a robust and entertaining homage. From the moment he is found on the grand piano aboard the glittering Virginian, Danny Boodman TD Lemon Novecento’s life is bound up inexorably with the ocean and music. Never stepping on dry land, Novecento absorbs all he knows of the world from the life that ebbs and flows through the ship, pouring each new story and melody he hears into the creation of otherworldly notes and compositions. Told through the eyes of Novecento’s best friend, trumpeter Tim Tooney, Baricco’s virile text echoes heroic fables and great myths, whilst winking at the beautiful and terrible minutiae that makes up life. In Roisin McBrinn’s undulating and rigorous production one is transported into Tooney’s ghostly memories with wit and verve. Olly Fox’s dreamlike composition further seduces us into his reminiscences and Paul Wills’ set of swinging links and piped corridors edgily facilitates McBrinn’s dynamic staging. Fusing it all together Mark Bonnar as Tooney gives a magnetic performance colouring his adoring narration with a frayed knowingness in a voice that reeks of jazz and gin. He is at once earnest narrator and clown and he carries this story with flare and passion. Michael Twaits is a performer who, since graduating from Mountview with an MA in Acting, has created a body of performance art/multi-media work which includes Confessions of a Dancewhore, Icons and The One You Love. He has performed at The Royal Festival Hall, National Film Theatre, Queen Elizabeth Hall and The Lowry as well as vibrant fringe venues The Oval House and Royal Vauxhall Tavern. A regular on the cabaret circuit Twaits is the flamboyant creator of the legendary Lady M, a foul mouthed but fabulous drag queen who has created quite a following for this witty performer. But as we talk about his piece for Pride 2010 – a reprise of Confessions – it seems that he is determined to leave such defined identities at the side of the stage and take a more exploratory view on people’s personalities. Honour Bayes chats to him about identity, campery, vodka and how, for all one’s glitz and glitter, it’s vital that you have something to say.